Reception Desks come in a variety of shapes, sizes and designs giving you the freedom to design the welcoming reception reflective of your business brand. Your reception is where clients get that first impression of what your company is all about. Through the various designer reception desks Apres offer and the shapes, colours and styles, we can assist you in conveying that feeling of sophistication and competence, ensuring clients and service providers alike feel at home when entering your business reception. Whether you are after a curved, straight, or L-shaped reception desks, comfortable and welcoming reception seating or just an armchair or two, Après can offer you with a wide range of reception furniture solutions that fit your reception needs, be it business, retail or shop front. Our modern reception desks offer you a wide range of standard reception counters in fixed sizes with various finishes or alternatively the option to design your own custom reception desk. Choosing to design your own reception desk allows you customise every last detail. Taking this route allows you to make something truly special and unique to your reception area. 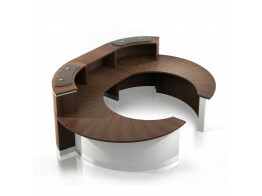 Apres Furniture can tailor your desk making it a unique reception counter or a thermoformed one-off unique designer piece, suitable for expansive reception areas, to neat and small compact reception desks for smaller businesses. 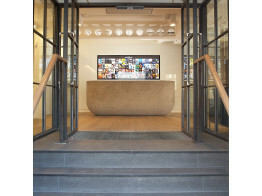 We at Apres Furniture pride ourselves on our expertise, which stretches from bespoke and Corian reception desks to more conventional modern reception desks, while our product range only features reception furniture from the leading British and European manufacturers. Contact Apres Furniture today and speak to one our reception desk consultants if you want a modern standard, designer or custom reception desk solution. Modern Concrete Reception Desks custom made to your specification for your business entrance. 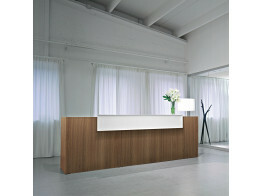 Fusion Reception Desk is a modular reception area solution available in various finishes and shapes. 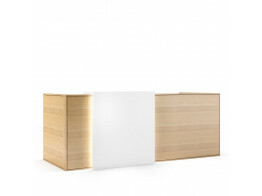 Factory Reception Desk is a modular receptionist desk featuring integrated cable management. 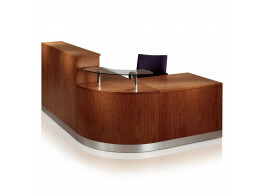 Luna reception desks offer modular straight or curved reception desk configurations. 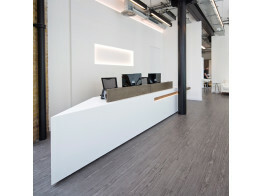 Modern specialist Corian Reception Desks are custom made using air cured concrete and steel. 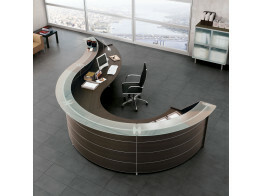 Crescent Reception Desks offer a modern solution to suit any business entrance. 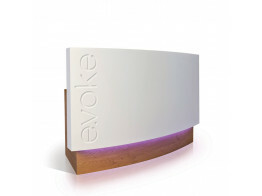 Modern Evoke reception desks combine corian with laminate, veneer, glass or steel for a professional finish.